Život podle Lucie: Confession: I love going to the dentist. I´m scared to go to the hairdresser. 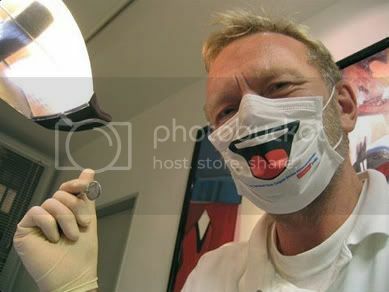 Confession: I love going to the dentist. I´m scared to go to the hairdresser. After reading this article you might think I´m insane. Because this is my confession: I love going to the dentist. And I´m truly terrified to go to the hairdresser. "Ah, you have such great, strong and naturally white teeth. And you are more and more beautiful every day, sweetie. As I can see you´ve got as good teeth as your dad and as beautiful face as your mom, sweetie,"
"You have terribly dry ends, do you ever have it cut? And why do you have such a hairstyle? You need a hairstyle for your long forehead, something like a fringe,"
What? Fringe? With my wavy hair? Who is insane here? And do not touch my hair, I cut the dry ends before I came here! "Oh, darling. You´ve got such great big eyes. Do you know how to accentuate them? By shaving your head or by a short hair cut. Your eyes would be like diamonds then. Can I cut it?" Right. Perfect. Again - with my wavy hair I will look like a sheep or Barack Obama. And my dear husband will divorce me. Do you understand me now? When I´m leaving my dear dentist I feel like a star with nice white teeth. While when I´m leaving a hairdresser I have a feeling of an unmitigated disaster. Everything on my face is wrong. Utterly wrong. Do you also have something like it? You can be honest with me. Or if you like taking of blood but faint at the sight of a grazed knee. Because...nobody is perfect. So have a nice Easter!